Brush Wizard: Space Hulk 4th Edition, Completed! Space Hulk 4th Edition, Completed! When the newest edition of Space Hulk was announced, I missed it. But thanks to the folks on Twitter I started realizing that a lot of people were suddenly working on painting their sets up, which lead me to search for prices on Space Hulk 3rd Edition again and that's when I found out that a new edition had just came out. Needless to say, I was hyped at the chance to pick up one of my grail games and jumped at the opportunity. It was Christmas time when I ordered my copy on a splurge and normally I won't make any big purchases during that time. But knowing that I missed out on 3rd edition, which became super spendy, I didn't want to have to worry about locating a copy later. Plus I knew that there was no way anyone would have already ordered it. I assembled it soon after. I hoped to play it asap, but it sat in the box until February (unplayed, because I lack friends that are interested in it). It was then that I saw Dan Donovan's Genestealers painting technique on Twitter and decided to get cracking on the set. While the wash technique for the Genestealers was super fast, it was still about a month before they were all completely finished. This was because I needed to develop a fast way to paint the Blood Angels armor plating and details as well. After assembling a test mini, I was able to figure out a 3 color scheme to paint their armor without mixing any paint. 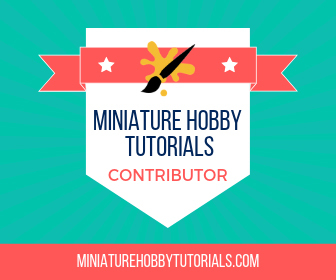 - Primer coat the entire mini with GW Skull White spray. - Base coat the armor with Khorne Red. - With a slightly thinned Mephiston Red, paint highlights on higher points of the red areas. - Thin some Wild Rider Red and paint the highest areas where light would catch. - Glaze the Wild Rider Red with a very thin coat of Mephiston Red. - Catch edges of top most armor and faces of helmets with Wild Rider Red for edge highlights. - Then finally, details details details. So when it came time to paint the Terminators, I already had the process down and it looks pretty good too. I painted the armor plating first and did every model in squad painting fashion. This was followed by base coating all their details (and missing a bunch along the way) in one fell swoop. Then once I was happy with where they were at, I started painting each mini one at a time to finish them up. I cut a lot of corners, compared to my usual process. All the metallics are painted and then washed. The bone areas are painted, washed and highlighted with a single color. The gems are all black base coat with a thinned coat of paint streaked down them and a single white dots. The wiring are all single coats with a black wash and the skin tones are also single coat and a brown wash. I was able to knock out 3-4 Terminators in a sitting once I got rolling, but it was at the cost of quality. That's OK though, since I was mainly painting them up for board gaming purposes. And unlike my Super Dungeon Explore stuff, I hadn't already committed to a slow process aiming for high quality. I did have a minor issue crop up while I was matte spraying them. I used an older can that was mostly empty to spray them, rather than the brand new can I had just picked up. Then after they were sprayed, I moved them out to my painting desk to dry. But, the matte coat dried cloudy... I was ready to give up on fixing it and just leave it be. But I figured I'd give them a 2nd coat using the fresh can to see what happened. Luckily, the 2nd coat fixed most of the cloudiness and they are now much better looking. I think the change in location and the fact that it was an old can was what caused the issues. Or it could have just been back luck. I'm super happy to have the whole set fully painted. I'm surprised I was able to knock it out this soon. 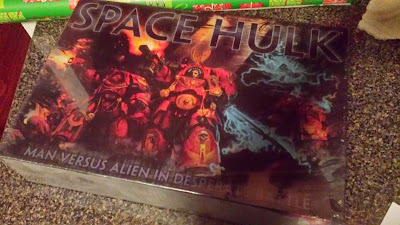 When I had originally ordered it, I figured that I'd be sitting with an unpainted Space Hulk set for years and years. But now, I give you Space Hulk, fully painted and ready for xenos exterminating action! Yrsa, Witch of the Wilds - Complete!